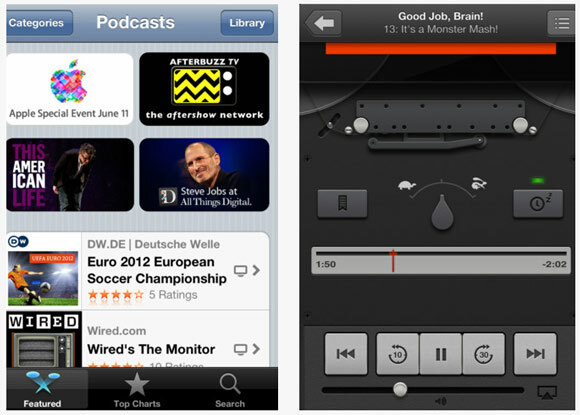 After a long wait Apple today finally released its Stand alone Podcast app for ios. Those running ios 5.1 & higher can enjoy this app from this second. The app includes 100 & 1000’s of pod casts in 40 languages. Podcast actually is an amalgamation of word “Broad cast” & “iPod”. It consist of series of episode that user subscribe to & receive the content in either audio form or video. It’s also termed as “Time shifted radio” as its medium is same but also offers user control when and where to listen. “Top station” feature in Podcast will give you pod casts according to topics, like we say art, business, music, comedy, news, sports & more. After selecting your Podcast you can “Subscribe” to receive latest episodes. They can be streamed or downloaded for Offline listen. “Program” icon in this show titles, number of episodes loaded, number of unplayed episodes. Clicking on “Show” button you get description of episode & find a button if you want to subscribe or unsubscribe particular episode. “Catalog” icon directs you to iTunes store through wall animation. You can view featured shows and search for new programs. “Categories” show you list of topics to select like art, music, news etc. “Library” button rotate wall & bring you there from where you started. Top station feature gives you the opportunity to select various topics. Share your playlists: You can share your created play lists with your friends via Gmail, FaceBook or Twitter. For Gmail you can send a link to your friend to share. For Face book & Twitter you can share with your friends by clicking share button. Enjoy both Audio & Video Podcasts at a same place. Using “Play back” Control you can skip forward & back of episode. You can hear offline also. Explore your favorite app in 40 languages. Turn Sleep timer to stop playing when you are about to sleep.